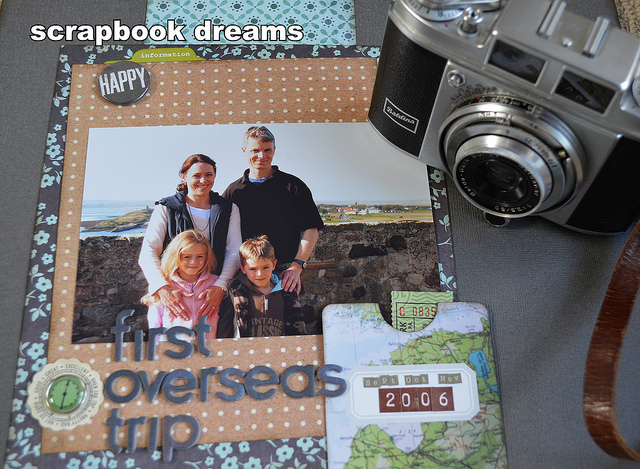 My scrapbook journey has been firing on all cylinders over the last 6 months. I have completed more layouts than I could have imagined. Mostly they are simple but I have loved the process and enjoyed the overall effects. I plan to share my favourites. My scrapping hiatus has revolutionised my creative flair. I am less fussed about perfection and more about the creative process. Like many scrappers I am also a Studio Calico kit subscriber and have loved getting "the latest and greatest" products new to the market. The above layout is the cover page for our family European trip way back in 2006. This layout using design principles by Shimelle (I just adore her) has products from the Central High and Roller Rink kits with some Kaiser Craft lettering.